The Norton Museum of Art cozies up to the holiday spirit with an exhibition fit for a dollhouse — literally. 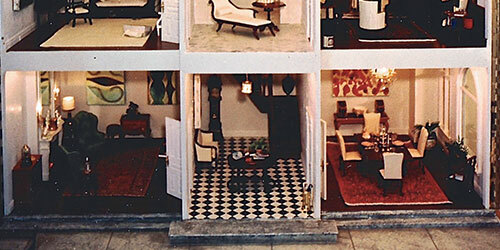 The public premiere of Miss Lucy’s 3 Day Dollhouse Party, Dec. 14-Feb. 4 at the museum in West Palm Beach, dusts off miniature artworks hung in the miniature houses of Jupiter collector Douglas Andrews’ mother (Miss Lucy). Not just any furnishings, these original mini-pieces were contributed by such name-droppable artist friends of the collector as Cy Twombly, Donald Baechler and Julian Schnabel. The three dollhouses include over a dozen rooms of art, scaled-down to inches.